One of the best parts of owning a tablet is drawing on the screen, whether that’s taking notes, sketching, or even painting. But lots of popular models don’t come with a stylus, and that includes the popular Microsoft Surface Pro (2017). Still, many people with a 2-in-1 can turn to the Wacom Bamboo Ink, which has been designed to be compatible with a range of Windows computers. This accessory costs $79.95, and is available now. Rather than being round, the barrel of the Bamboo Ink is triangular shaped. It’s still quite rounded, though, without sharp edges. This stylus is 5.75 inches long, and 0.4 inches in diameter at its widest point. We found it it quite comfortable to hold, and easy to grip, even for long periods.Partially, this is because it’s not slick. Instead, Wacom put a pleasant “soft touch” texture on it. There’s a handy metal clip to attach the Bamboo Ink to a case or gear bag. There are no magnets built in to hold this accessory to the computer, but we have found these in rival styli to be utterly unreliable, so we don’t miss them here… and don’t recommend people depend on them with other active pens. There are two buttons on the Bamboo Ink, one on the top and another on the side. The top button is used as an application launcher. One, two, or three quick presses can open the Windows Ink Workspace, Sticky Notes, the sketchpad, screen sketch, or other apps. It’s up to the user to decide which. The side button doesn’t protrude much from the barrel at all, so it doesn’t get in the way. At the same time, it’s easily available to be used as a right mouse button. The Bamboo Ink supports hover on our test Surface Pro, so just putting the nib near something on screen and tapping the button opens the options menu. Wacom includes three alternate nibs with this product: one hard, one medium, and one soft. A second medium nib comes pre-installed in the stylus. These come in a case who’s main purpose is to keep these tiny items from getting lost. Even this is just 1.6 by 1.2 by 0.25 inches, so be sure to find a good place for it so it can be found when needed. But the case has one more trick: on one edge is a hole lined with metal: to remove a nib from the Wacom Bamboo Ink, insert it into this hole, turn the stylus to bind the pen between two of the sides, then pull gently. Don’t try to pull a nibs out with one’s fingernails, as this can damage it. When using a fingertip or capacitive stylus, the touchscreen alone can tell the location of contact. Active pens need to communicate much more than this, especially how hard the nib is touching the display. The pens communicate these details to tablets by one of two incompatible standards: Microsoft Pen Protocol (MPP) or Wacom AES technology. The feature that sets Wacom’s stylus apart from its rivals is that it supports both of these. Every other similar accessory we’re aware of supports only one. Plus, switching between the two only requires a combination of presses on the side button, so this pen can be easily shared by multiple devices. Or a shopper can buy it with reasonable confidence that it’ll work with their next Windows tablet. That said, this stylus doesn’t support devices that use the old Wacom EMR standard, such as the first- and second generation Surface Pro versions. There’s also no support for Synaptics’ active pen technology. And it absolutely doesn’t work with any iPad; this is Windows only. Like most current active pens, this accessory needs to be paired with the computer over Bluetooth. This is used to tell the tablet about presses on the top and side buttons. We tested Wacom’s Bamboo Ink with a Microsoft Surface Pro 4, so we used the Microsoft Pen Protocol (MPP). The following comments should be taken with an important consideration: no one on our staff is an artist. We’re long accustomed to using styli to take notes or make the occasional sketch, but we can’t advise on what it’s like to use the Bamboo Ink to create great art. As discussed, Wacom includes three nibs, hard, medium, and soft. By paying close attention, we can tell a slight difference between these, but it certainly isn’t dramatic. The softer the nib, the more using this active pen feels like writing on paper. The drawback is that they wear out more quickly. Harder nibs last longer. Wacom doesn’t publish how many levels of pressure are supported by the active pen, and we know of no way to determine it. It could be as low as 1024 or as high as 4096. That said, we suspect it’s 1024 because otherwise Wacom would brag about how advanced this product is. The Surface Pro 4 responded to even light touches of the Bamboo Ink. And it didn’t skip while drawing any of our test lines. Some active pens run into problems when the tip is moving slowly: the screen can’t seem to quite decide where the tip is, leading to lines that are just a little bit wiggly. There was some jitter when we drew slowly on the screen with Waco’s offering, but only a slight amount. If the Wacom Bamboo Ink has tilt detection, we were unable to see any sign of it. This is unfortunate, as it makes creating art with the device much more challenging. We found this active pen to be easier and more comfortable to hold than any version of the Surface Pen, but thought them otherwise nearly identical when being used for taking notes or sketching. When it came to more artistic creations, the lack of tilt detection in Wacom’s offering gave the fourth-generation Surface Pen the advantage. 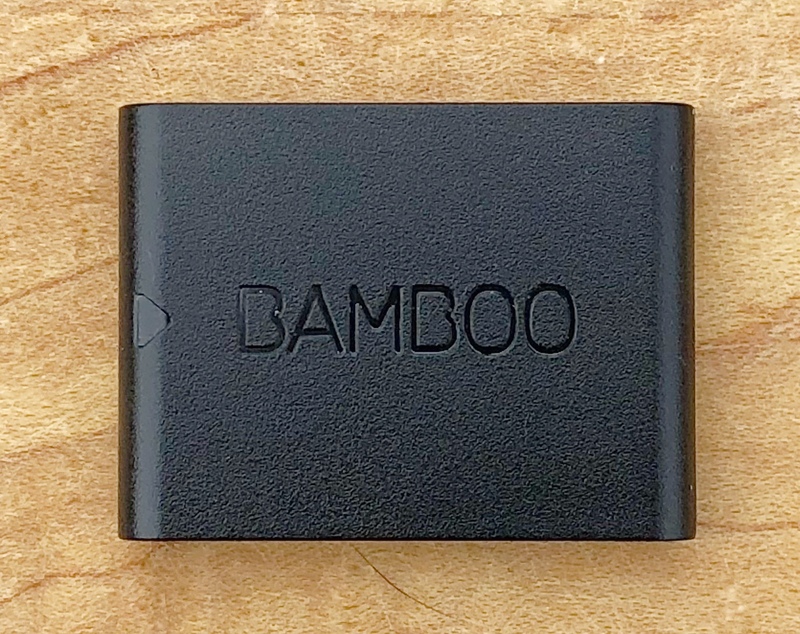 Wacom’s Bamboo Stylus is powered by a single tiny AAAA battery. That’s nothing unusual. Its rival pressure-sensitive styli also require batteries to work. We don’t know how long each battery is expected to last, as Wacom makes no promises. The one that comes with this accessory is still going strong at the end of all our tests. When the battery goes flat, it’s easily replaceable—just unscrew the top 1 inch of the barrel—and we recommend that anyone who depends on this accessory keep an extra AAAA in their desk and gear bag. The Wacom Bamboo Ink doesn’t have the features to be a premium active pen, but it isn’t priced as one either. We think it’s best suited for businesspeople and students who want to take hand-written notes. Artists looking for a creative tool are almost certainly going to miss tilt detection, and will probably want more levels of pressure sensitivity. Wacom’s suggested price for this accessory is $79.95. For comparison, Microsoft charges $99.99 for the fourth-generation Surface Pen, which offers more features. Replacement nibs for the Bamboo Ink are $9.95. That’s a comparatively good deal, as Microsoft wants twice that much for replacements for the Surface Pen.